Like all airlines Fiji Airways has a dedicated check in for their business class. If you are a Tabua Club member (Fiji Airways loyalty scheme) you will also be graced with preferential check in. It is a bit more of a lengthier process to check in than I am use to, but staff bubble Fijian bulla friendliness. Lounge access isn’t that straight forward. Well it is if you are travelling business class, you will be granted access to Qantas’ business class lounge. Travelling economy and a Qantas Club Member? 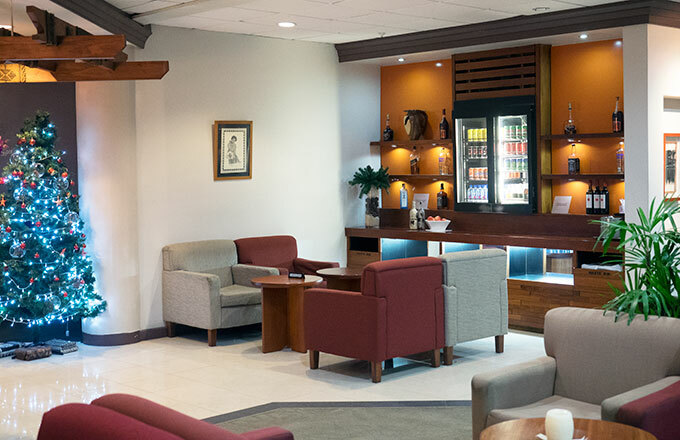 If you have booked your ticket directly with Fiji Airways, you will not be permitted to use the lounge. The trick is to book your flight to Fiji on the Qantas website. 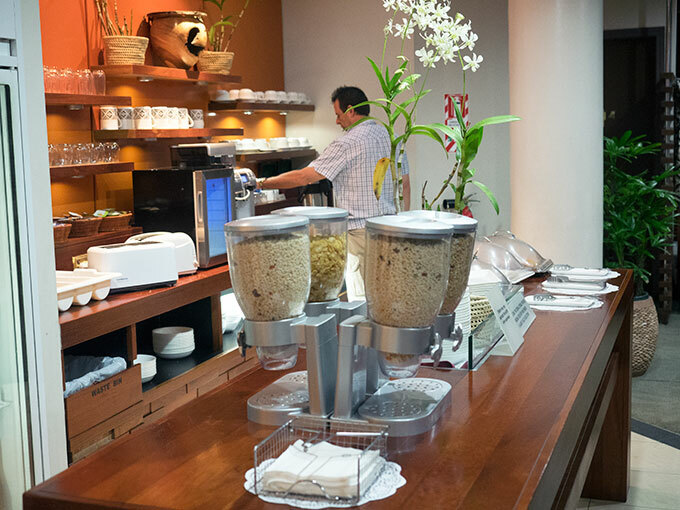 This way your booking will be allocated a QF flight number and you will be eligible for lounge access. On boarding you are greeted with warm friendly Fijian smiles. The cabin is light and airy, automatically giving you the feeling of heading on holidays. Once seated you are offered something to drink, I happily say yes to their signature cocktail which is a white rum and cherry creation. A cold cloth is also offered for a quick pre flight freshen up. 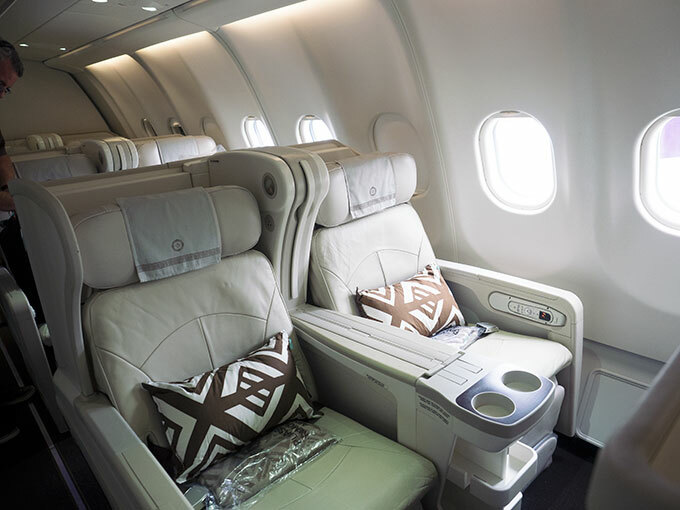 There are 24 seats in business class, in a 2-2-2 layout. They are pods style similar to Qantas. This means if you have a window seat, and the person next to you is lying down you will need to clamber over them to get to the aisle. Being a short daytime flight this isn’t an issue, but my least favourite layout for long haul over night flights. 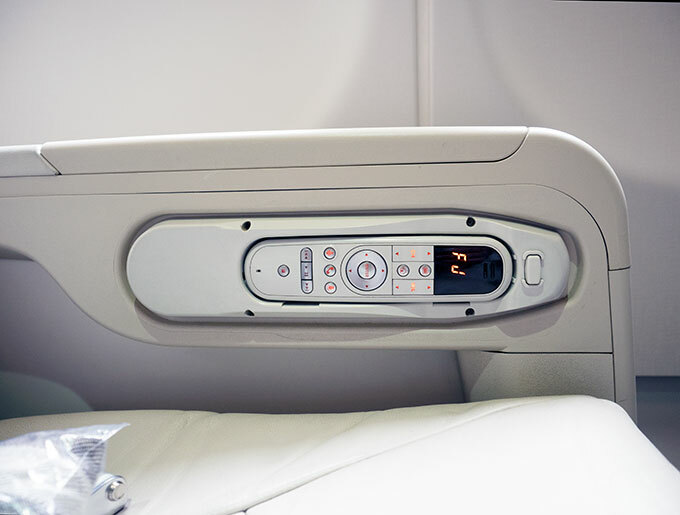 The seat folds out to an angle lie flat bed, which means you are on a bit of a slope to sleep. For our short 4 hour 55 minute flight from Sydney they are more than we require. 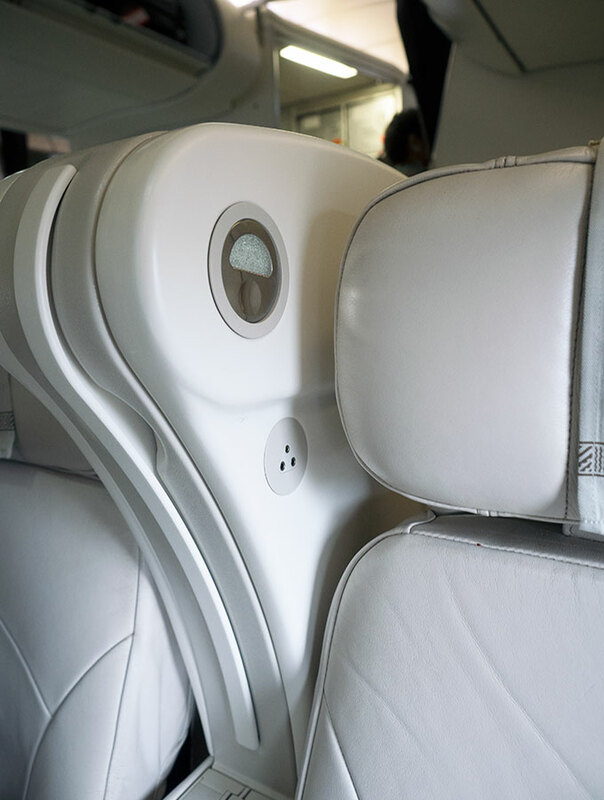 There is a privacy screen between the seats, which means you can ignore your neighbour if you wish. Beside overhead storage there is some storage space under the seat in front of you. Also a couple of smaller storage draws in the back of the seat in front. These are perfect for keeping your phone, wallet, passport etc. 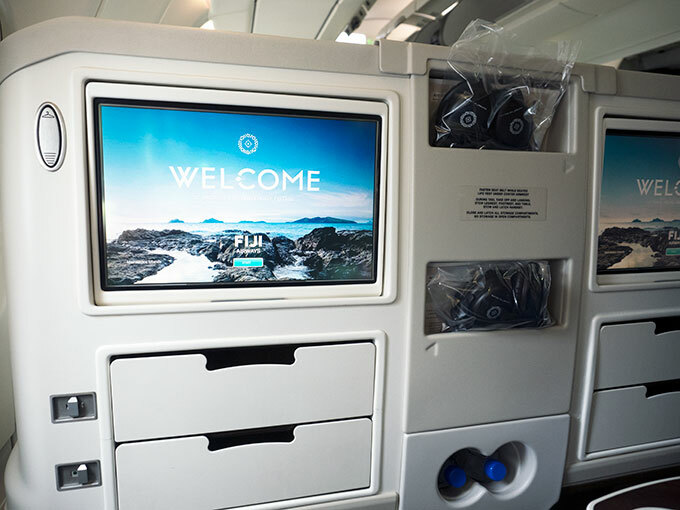 The Fijitime inflight entertainment offers a vast selection of movies and TV shows, as well as music. Noise cancelling headphones are supplied, I didn’t try them out as I always travel with my Bose Noise Cancelling Headphones that I love. As this was a daytime flight, we didn’t sleep. Amenities kits are only offered on overnight flights. Again there is dedicated check in for business class passengers. From there it is on to the Tabua Lounge. Qantas FF, Gold or above and travelling on a Fiji Airways (FJ) or Qantas (QF) number you may go in with one guest travelling with you. Additional guests over the age of three may gain access for FJ$75. 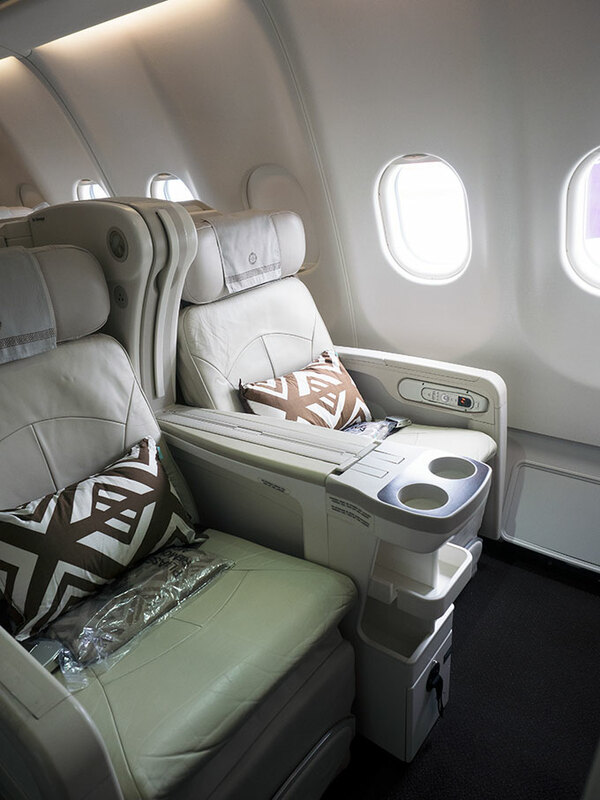 Fiji Airways Tabua Club Members traveling on a FJ number have access but no guest access. You will need to purchase a discounted guest pass (FJ$50). 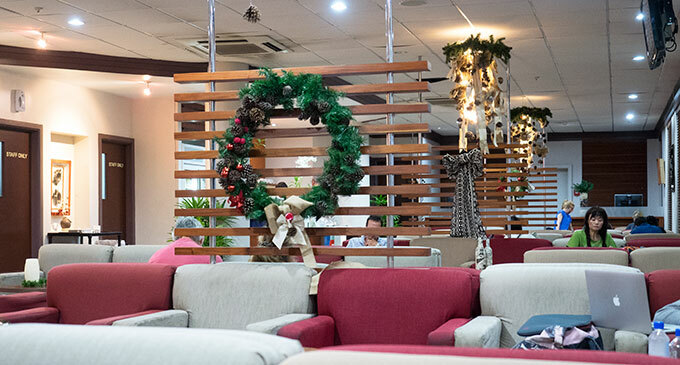 Fiji Airways Tabua Club members not travelling on a FJ number, i.e. Qantas code share need to pay FJ$25 to access. Additional guests need to purchase a discounted pass (FJ$50). The lounge is adequate enough with large comfy seats and a dedicated area for the kids. We had major issues with the complimentary Wi-Fi, we hard difficulties accessing it, and when we could it was snail pace slow. There is a shower to use if you need to freshen up. We were there for breakfast and there was a continental offering if we felt like it. Would I pay the extra to gain access if I had to? Probably not. The aircraft is the same as our journey to Fiji from Sydney. This time instead of having the bulkhead seats we were back in row 3. Being a bright and early morning flight, breakfast was offered. To start we had a selection of fruits, cereal, yoghurt and a selection from the bakery served with butter and jam. For the main event there was a choice of omelette, chicken sausage, corn cake, tomato sprinkled with cheese and parsley, mushroom and kamala. The other was a sweeter choice of three layered pancakes served with caramelised banana and whipped cream. I went for the savoury option. 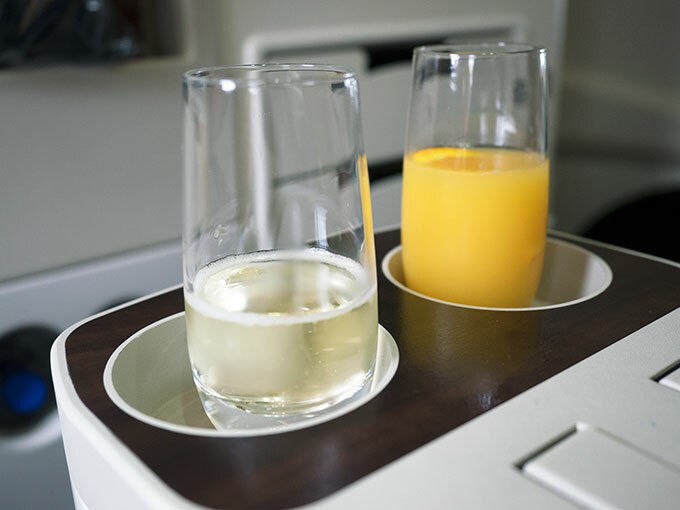 To drink I had champagne and juice, the perfect accompaniment for an end of holiday flight. Fiji Airways don’t hand out fast track passes to business class passengers before getting off the plane. When I asked about them, I was advised I would have to get them once off the plane. From where and from whom, I still have no idea to this day. 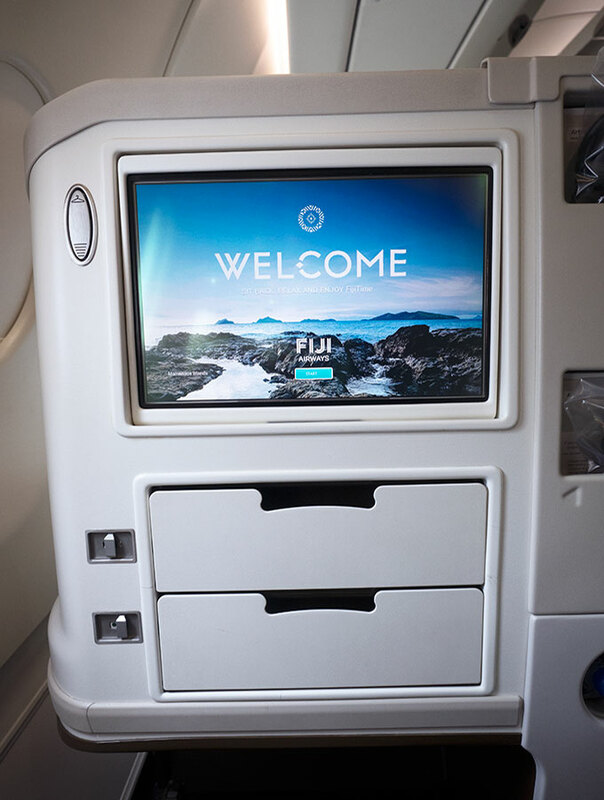 All in all our experience on Fiji Airways was a really enjoyable one. We had everything we needed for a short haul flight. The staff are friendly and accommodating. 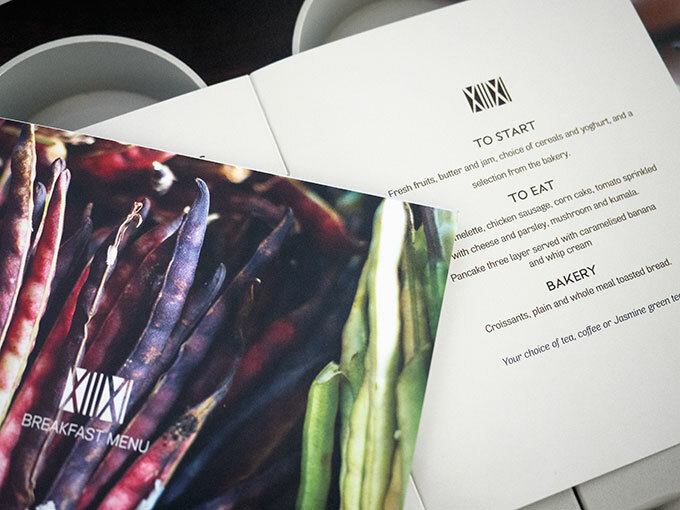 The food is okay, not as great as others and there is a nice selection of drinks on offer, including a signature cocktail. If travelling to Fiji for business there is plenty of room to pull out your laptop and do some work. Would I consider a long haul overnight on their A330 business class to say the USA? Unless I was planning a holiday in Fiji on the way to or back from the USA, then probably not. Especially with so many airlines now offering a full lie flat bed. Don’t miss one delicious recipe, restaurant review or travel adventure. Sign up to our weekly newsletter below to keep updated. There is also bonus content just for subscribers. 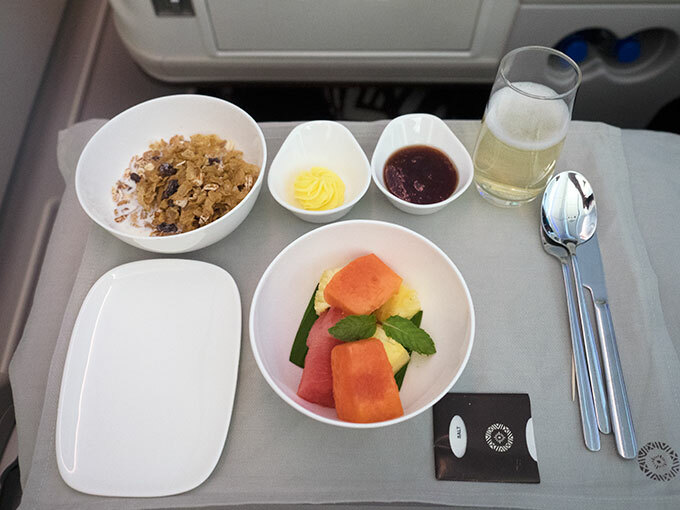 I’ve never flown with Fiji Airways but it looks amazing. It looks like you had a very comfortable flight! What caught my eye were the patterned pillows, that was a nice touch! It looks quite pleasant, wouldn’t say no to a flight with them. Especially with the option of pancakes with caramelised banana! Seat 1A has been a goal of mine, lol. I was upgraded to first class once as a little girl and I have been dreaming of sitting in one of those plush seats again. I also love your tip about booking your trip through the Quantas website to get the Lounge Access. Great advice! The seats look super comfy and I’m impressed with the breakfast selection! We usually don’t upgrade as it can get pricey traveling with kids, but it’s a nice option for a getaway with my husband. 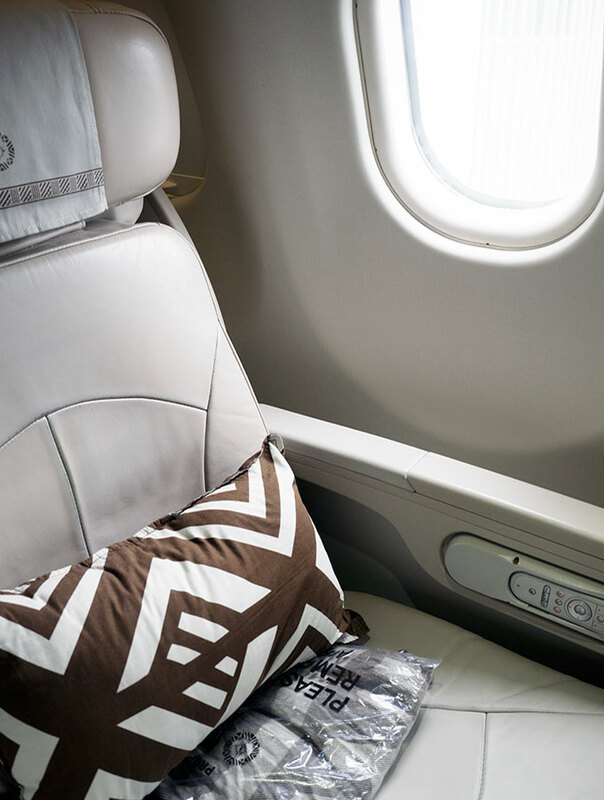 Business class on Fiji Airways looks excellent- I’ve only ever flown Business once, but it was a very enjoyable experience. But I’m a bit surprised about not being handed Fast Track passes, I always thought they were a given when flying Business. I always fly economy, I find other classes so expensive. I would rather spend my dollars on other destination experiences rather than on getting there. So I just choose travel times that are nor sleep hours. 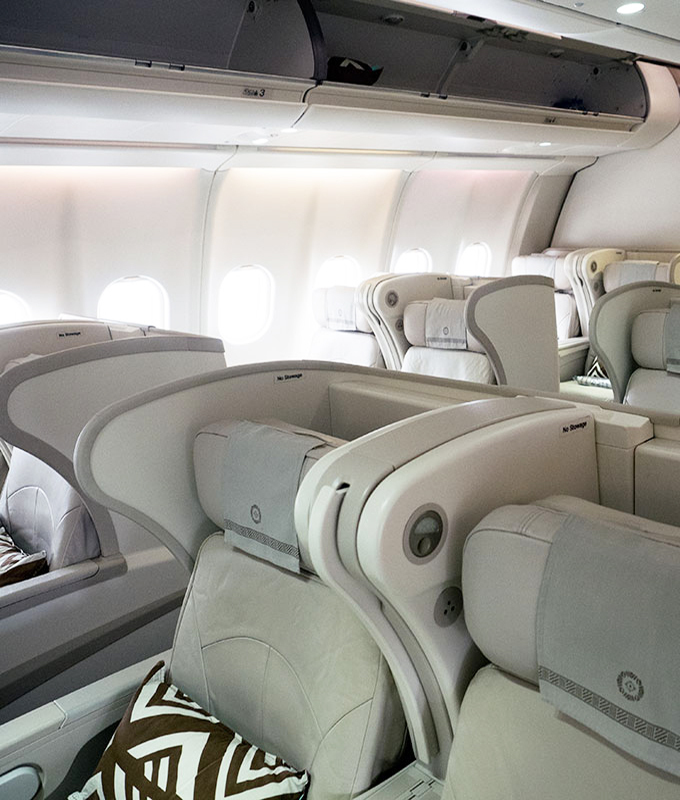 The business class seats look excellent and very comfortable. It makes such a difference especially on a long flight. I have just flown Virgin upper class and cannot recommend it highly enough. The food looks good!